The Weeknd and Bella Hadid came to play on Halloween night. On Wednesday evening, the Hollywood couple stepped out for Heidi Klum’s 19th Annual Halloween Party presented by Party City and Svedka Vodka at Lavo New York. We’re told that once these two went inside, they couldn’t help but display some serious PDA. Later in the night, our eyewitness saw the pair dancing on the dance floor that was filled with familiar faces including Ice-T and Coco, Padma Lakshmi, Dylan Sprouse and more stars. 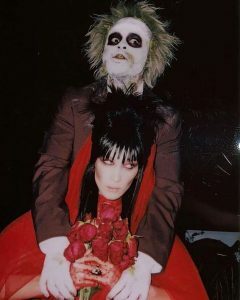 While these two appeared to have plenty of fun inside, the rapper and supermodel also enjoyed taking pictures as Beetlejuice and Lydia for the gram. Christine Nelli deserves credit for Bella’s hair while Matthew Henson and Mimi Cuttrell helped with the couple’s looks. As for the clothes, The Weeknd wore a vintage Pierre Cardin suit and vintage Stacy Adams shoes while Bella opted for a one of a kind Maestro Couture red dress. While these two deserve plenty of credit for their looks, hostess Heidi and boyfriend Tom Kaulitz didn’t disappoint with their costumes. The pair transformed into Shrek and Princess Fiona from the popular animated movie. In other words, couples ruled at this bash!